I remember being hesitant to review Stonelake's 2008 entry Uncharted Souls because I had read too much bad press beforehand. However, I secured a copy, did the review, and found the work enjoyable, yet only after repeated spins. Similar reservations surfaced again when Stonelake's latest, Shades Of Eternity, dropped on my desk. Frankly, after one spin, I should have listened to my gut instincts. Shades Of Eternity isn't horrible by any means. Simply, I found it difficult to wrap my ears around this one. It left me ambivalent to the point that I believed my time could have been better spent. Except for three notable exceptions (more below), seven songs have a predictable melodic metal style nearing melodic hard rock with a noticeable keyboard presence giving it, at times, a symphonic ambience. Most of these are too long, and Peter Grundstrom vocals sound like strained screaming. Yet all the songs are saved by that same impressive keyboard work and also lively guitar solos. The exceptions were the songs that moved closer to melodic hard rock: Rescue You, a well-paced, catchy number with a fine keyboard foundation; Can't Steal Your Heart, another smooth melodic number which allows Grundstrom to lighten up; and, Treat Me Right, a fine piano driven hard rock ballad with a great guitar solo which is only hampered by it's excessive length. Towards the end, Rage Of A Lion and Fly Out also near the melodic hard rock style allowing Shades Of Eternity to end better. However, by this point, I had had enough and was ready to move on to the next offering on my review desk. 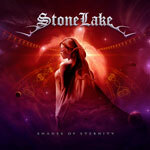 Stonelake's latest venture,Shades Of Eternity, is disappointing affair melodic metal mixed with hard rock and layered with substantial keyboards which, except for few highpoints, will probably leave you largely unimpressed and mostly ambivalent.